Many people traveling to Colombia will wonder whether or not they should visit Bogotá, Colombia. 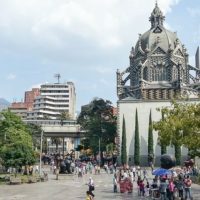 While it is a typical sprawling capital city of a Latin American country with a chaotic atmosphere, where millions of vehicles are jammed into the gridlocked roads and highways and where a veritable sea of people from all corners of Colombia come to the big city to improve their lot in life. While the chaos and sheer humanity can be overwhelming, it’s precisely for that reason that makes it such a dynamic and interesting place. One thing is certain, there are many things to do in Bogota, Colombia, and you won’t be left bored here. Bogota is a cosmopolitan city, consisting of around eight million people concentrated in a valley across 613 square miles, making it the largest and most populated city in Colombia. Many people from all over the country (as well as foreigners from around the world) come to Bogotá to look for better work opportunities or to study in prestigious universities, meaning that it attracts a huge diversity of people. However, despite the numerous problems that arise with cities of this size in a developing country, you can see many things that set the city of Bogotá apart from some of the other boring cities that I’ve visited in my lengthy travels through Latin America. One thing I love about the city is how very multicultural it is, but it still retains some characteristics that give it its own identity. Anyways, here are but a few of the many recommendations for things to do in Bogota and which will help you make up your own mind about this bustling big city… At the least, you should never be at a loss for things to do and be asking yourself about what to do in Bogota! 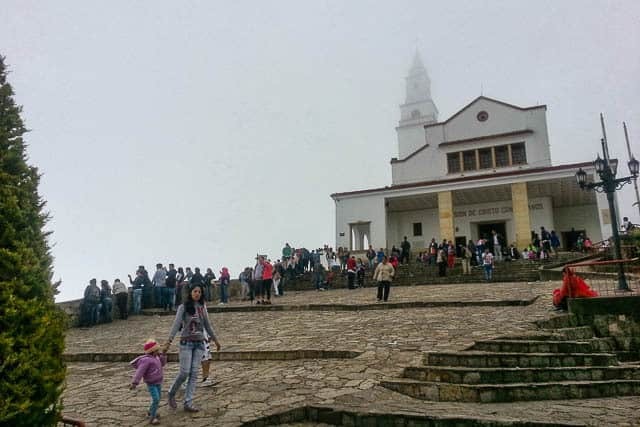 Cerro Monserrate is a hill that stands out at 10,341 feet (3,152 meters) above sea level, on top of which there is the church of the Fallen Lord (Señor Caido) that inspires many pilgrimages due to the miracles that have been attributed to it. It is also perhaps one of the best symbols of Bogota and something that I would consider a must do here. In addition, there are colonial style restaurants with national and international cuisine and also places to buy handmade goods and typical foods like the very famous, hot chocolate with cheese, which is very characteristic of the city. You can climb the entire hill on foot (a climb of almost 500 meters), by funicular railway (it’s like a tram) or cable car (I personally like this one more). You can find schedules and rates here. Visiting Monserrate will give you an unparalleled view of the city and will keep you busy for at least half a day or almost an entire day. On the cloudy day when I visited, we couldn’t even see the edge of this sprawling city. If you go to Bogota and do not visit Monserrate, that’s just a travesty! I consider this to be a must do and one of the top things to do in Bogota, for sure..
La Candelaria is located in the center of the city and is the old historical center. This means that the neighborhood is filled with interesting architecture in the old colonial style. It is also ground zero for most backpackers and foreign travelers (while most stay here, you might want to check out this guide to choosing the best neighborhood in Bogota). Basically it’s like Monserrate, you’ve got to visit La Candelaria, not only because it is the most traditional neighborhood of the city, but also because it is where you will find the Gold Museum, the Church of Candelaria, Plaza Bolivar, the House of Nariño (presidential house), the Congress, and so many other museums, churches, restaurants, cafes, cultural houses, theaters and more. It’s a place where you can just walk around, exploring aimlessly, or hop on one of those organized tours, like one that tours the coolest graffiti art or explores the city by bicycle. But if you aren’t into organized tours, the next best thing is to explore Bogota like a local. 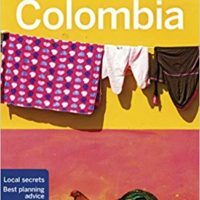 If you don’t know anyone there, I’d recommend contacting this company to have a local Colombian plan your trip. I’ve organized a 5% discount with them for all my readers. There are many affordable and cool hostels here, so it makes it a logical place to stay in Bogota if you want to be in the heart of it. 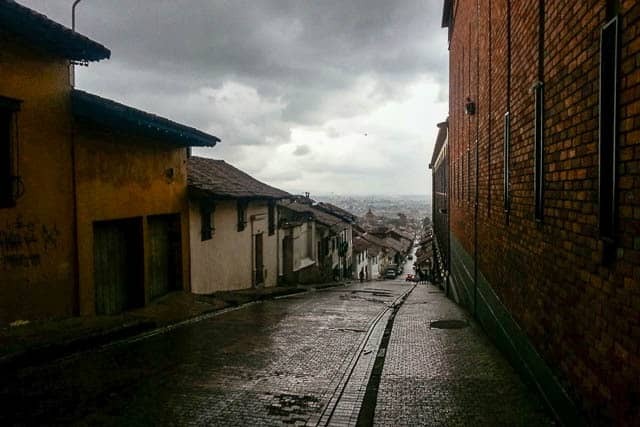 Exploring any city one foot is my #1 recommendation for exploring a new place, and thankfully Bogota has a pretty great free walking tour put on by the folks at BeyondColombia. This is another must do that will have you trekking past many of the highlights in La Candelaria while you learn about the complicated and crazy history that Colombia has experienced, from FARC to the Bogotazo, to the siege at the Palace of Justice. Part of Colombia’s magic is understanding just how far they’ve come in a short period of time, and there’s no better way to do that than better understanding the local perspective. These walks are tips based but don’t have a set price. If you’re looking for another great organized activity, I’d consider also doing the graffiti tour as Bogota is one of the world’s best cities for street art, no doubt. Or read more about the best Bogota tours to see what piques your interest. 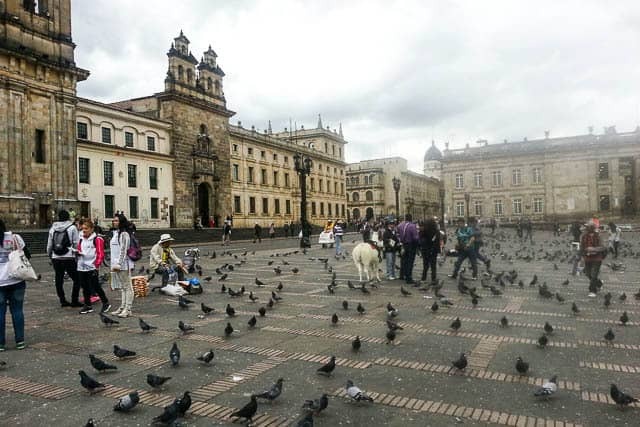 Reserve your Free Bogota Walking tour here. The Museum of the Bank of the Republic, also known as the Museo de Oro, is located in the La Candelaria neighborhood, right in the center. It is the museum with the largest gold collection in the world and was declared a National Monument. It has more than 30,000 pieces of gold and more than 50,000 pieces including ceramics and textiles from the pre-Columbian period by some of the most important pre-Hispanic cultures of the region. It also has a coffee shop and a restaurant, thankfully, because it will definitely take you all day to cover this massive museum. It is something that no museum lover can miss and will also provide an important insight into Colombian history. You can see the schedule and rates here. Plaza Bolivar is the main square here in Bogota and is a massive plaza surrounded by the prominent Cathedral of Bogota and a number of important public institutions like the Palace of Justice (basically the Supreme Court and which was the battleground for that infamous siege in 1985), the mayor’s office, and other important buildings. Pro Tip: Around the corner, be sure to visit La Puerta Falsa (The False Door), which is a tiny little cafe with more than 200 years of history. It is a great place to enjoy some great Colombian food like the local favorite, ajiaco, an almojabana, or even their freshly made tamales. This place oozes history and is a must visit restaurant for a reason. Also around the corner from Plaza Bolivar is the stunningly ornate Museo Santa Clara which easily ranks among Colombia’s most beautiful churches. It was actually part of a convent that has since been demolished, but thankfully this breathtaking place was preserved with its ornate ceiling and walls covered in nearly 150 pieces of art. This is one of Bogota’s oldest churches (along with the San Francisco church near the Gold Museum, which is also breathtaking for the beauty of its gold altar) and it deserves to be seen, for sure. Both San Francisco and Santa Clara are most impressive for what is inside, but if you’re looking for one that is stunning from the outside, don’t miss out on the Santuario Nuestra Señora del Carmen on the southern edge of La Candelaria for what looks like a giant candy cane. While La Candelaria is the beating heart of the lively tourism scene in Bogota, another one of the most traditional and popular areas of the capital city is Chapinero, a neighborhood located in the north of the city, this is what I would consider one of the best overall neighborhoods in Bogota, for sure. Here is where you will find the best and most varied restaurants, cafes and bars, El Teatro al Aire Libre de Bogotá, Plaza de Mercado de Paloquemao, museums and more. The area is bohemian and youthful because it houses a large university population. The best thing to do here is to just walk the streets and enjoy the many cultural and gastronomic spaces of the area. If you’re staying long term in Bogota, or want to get away from the backpacker mecca of La Candelaria, then Chapinero should be at the top of your list for an eclectic, interesting, and hip neighborhood, although most first-time visitors choose to stay in Candelaria. In the end, Chapinero is my favorite neighborhood in Bogota. This theater festival has been happening for nearly 30 years since it first began and has performances over the course of approximately two weeks. The festival has thousands of invited artists from around the world and hundreds of plays performed in theaters with tickets for every budget, including many free street performances. During the festival, they turn almost the entire city into one of the most important cultural spaces worldwide. If you don’t want to miss this important cultural event, then check the calendar because it takes place every two years around March and April. Simón Bolívar Metropolitan Park is the largest and most important park in the city, it is a space where concerts are held since it has an open-air theater, but its most important function is to provide an amazing recreation space for locals. Here you can play sports, go for a run, or just relax in its green areas or beside one of the lakes, in a space that cover an area of 280 acres. It also contains many tracks for cycling and jogging and walking. It is particularly popular on Sundays, or where nine-to-five workers enjoy their free time like lunch breaks, along with El Virrey Park, located near the Zona Rosa, which I will discuss later. Near the Simon Bolivar Metropolitan Park, you’ll find the Bogotá Botanical Garden (Jardín Botánico de Bogotá) which is a pretty awesome place to just go for a walk, reconnect with nature, and to escape from the often chaotic nature of big city life. This Botanic Garden specializes in local plants ranging from rare orchids to plants that are found in the high Andes. Personally, I love these types of places and find them to be great visits, particularly if you plan to do any hiking later on throughout Colombia. Entrance is cheap, at only like $1, so it’s definitely worth it. Ajiaco is one of the most popular and traditional of the typical dishes of Bogotá (and Colombia). It’s basically like a really delicious chicken soup with a few differences, but I’m not going to give you any more details because you definitely have to try it yourself. 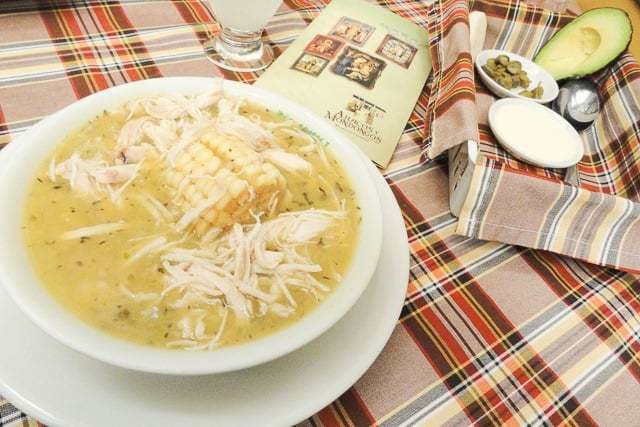 It is unforgivable if you do not try ajiaco in Colombia… It is delicious! In the following link there is an article in Spanish with 5 restaurants that offer the best ajiacos in the city, according to those who know a little more about the city dining scene: click here. If you don’t read Spanish, I’ll just repeat that La Puerta Falsa is mentioned as one of the places with the best ajiaco in the city — so go there. Another great way to get an introduction to the local cuisine is to hop on a Bogota food tour which will introduce you to things like patacones, tamales, visit local markets and lots more. Be sure not to miss my huge guide to Colombian food! 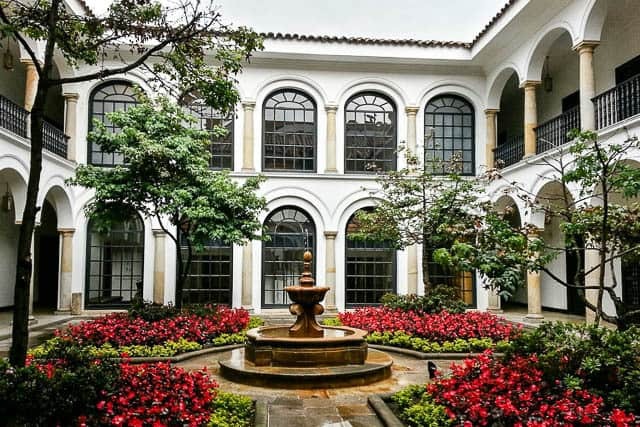 The Zona T is also known as the Zona Rosa, is the upscale and luxurious part of Bogota, where you will find shopping centers, 5-star hotels, high-end bars, restaurants, clubs and all the best nightlife of the capital. It is in the same area as the Parque de la 93 and El Virrey, with many options to eat and party (rumbear in Spanish). While prices may be higher than normal in Colombia, it will still be comparatively cheap since you’re in Colombia and paying in pesos rather than dollars. If you want to explore this part of the city, especially at night, I recommend Uber as a good way to get around when you are enjoying the best nightlife in Bogota. There is also an emerging craft beer scene here in Bogota, so if that’s your thing (like me!) 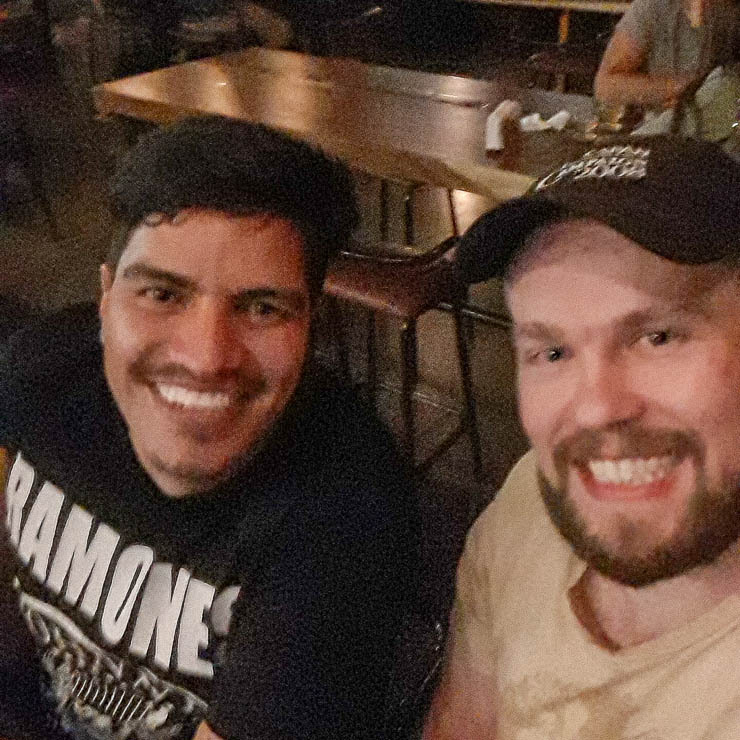 then you’re not going to be disappointed by some of the options available here in Bogota, certainly one of the best beer destinations in the region (although don’t expect Seattle or Portland). The biggest craft brewery here is Bogota Beer Company (BBC) which you’ll also find here in the Zona T and is worth a visit. The good news is that you’ll find their brews in other big cities as well! The Museo Botero is located in the La Candelaria neighborhood, where you can find many works by Colombia’s most famous artist, Fernando Botero. His works often depict plump, fat figures, people, and still life and he is famous around the world. You may have seen his art without knowing his name. 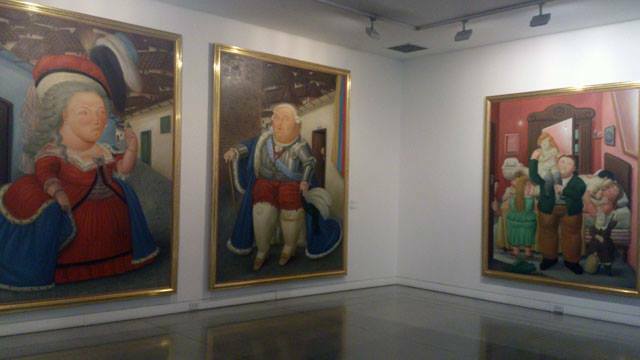 Many of the works were donated by Botero to the Banco de la República, which make up the bulk of the museum, but there are also many other renowned international artists. And best of all is that entry to the Botero Museum is free! See the museum schedule here. If you want to learn more about early human history in Colombia, this is the place. Here you will find thousands of archaeological pieces of the different ethnic and cultural groups of the country during pre-Hispanic times, as well as the works of artists from more recent times. The National Museum is actually the oldest and largest museum in all of Colombia, housing more than 20,000 pieces of art, archaeology, and more. Not only that, but it is also one of the most important museums on the entire continent. The entrance fee is super economical and you can find the latest schedule here. 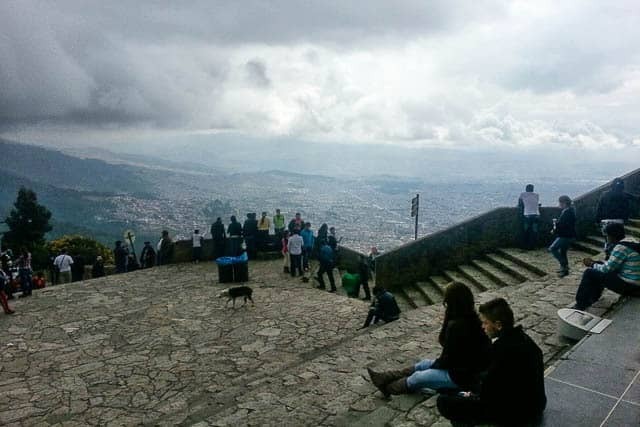 If you were in love with the view of Bogotá from Monserrate, then you can enjoy another opportunity from the viewpoint of the Colpatria Tower in the middle of town. At 49 floors and a height of 561 feet (171 m), it is the second tallest building in Bogota and the third highest in Colombia and offers a panoramic 360-degree view of the city, all for only 7,000 Colombian pesos (a little over $2). If you want to know the schedule, click here. The town of Usaquén, which is simply a northern area of the city close to the Zona Rosa, is composed of several high-end neighborhoods. It is characterized mainly by offering several options of shopping centers, good restaurants, and bars, and is a popular place for many to enjoy a walk on a Sunday afternoon and tour the streets of its colonial center. One of the coolest things to do here though is to visit the sprawling Usaquen “flea market” (mercado de las pulgas) which lines the area streets with all sorts of local crafts and goods. I particularly enjoy this open-air markets like this, so I highly recommend making the trek up to the north. This happens every Sunday in the area surrounding the Parque de Usaquen. This lake is just over 2.3 square miles, sits in the municipality of Sesquilé 35 miles (57 km) north of Bogotá and is one of the best day trips from the city. The lake is the place of origin of the legend of the golden city of El Dorado, a place where the natives of the Chibcha culture performed rituals and had many gods made out of gold; and which is why it has been the epicenter of numerous expeditions to search for these valuable relics. 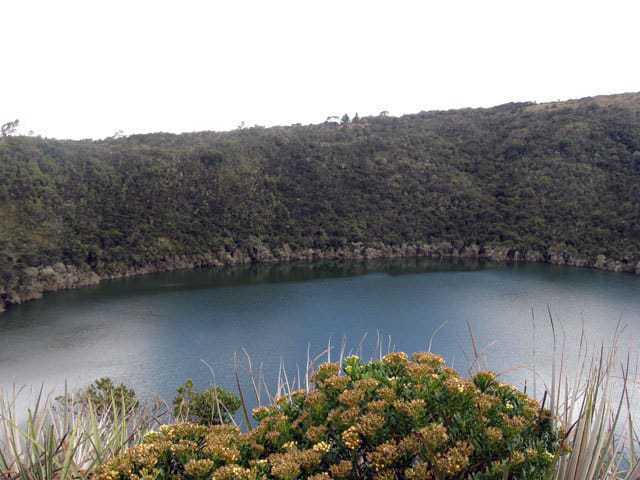 The place offers a path to relive the times of old and also allows you to see the distinct fauna and flora typical of the páramos of Colombia, which sit above 10,000 feet (3,100 meters) above sea level and where you will find the emblematic frailejones plants. You can enter the park from Tuesday to Sunday and Monday holidays from 8:30 a.m. at 4:00 p.m. For more information and other recommendations, enter here. This 515-foot waterfall on the Bogotá River is located 18 miles (30 km) southwest of the capital in the town of Soacha. While the waterfall is massive, please note that the water is not super clean, since it carries the wastewater from a small part of the city. Although it was once a much larger waterfall in terms of volume, complete with a lot of amazing fauna and flora making it a natural tourist attraction for a long time, the pollution of the Bogotá river and the reduction of water for hydroelectric plants before the falls have greatly reduced its flow and hence its primary appeal. During that touristic golden age, they constructed an awesome luxury hotel which has now been abandoned and converted into a museum, where ghosts are now their only guests, according to popular legend. These stories are fueled by the number of suicides that occurred at the beginning of the last century at the falls. Its surrounding wooded landscape helps give it a more mysterious and haunting atmosphere as well. In short, Tequendama Falls is a place that generates conflicting opinions, some recommend it and others do not like it. At the least, it is a look into the negative impacts that man has made to some of our most spectacular natural resources. The good news though, is there are now projects for the recovery of the falls and the surrounding area. I had to tell you about the good and the bad so that you can decide for yourself whether to go or not. 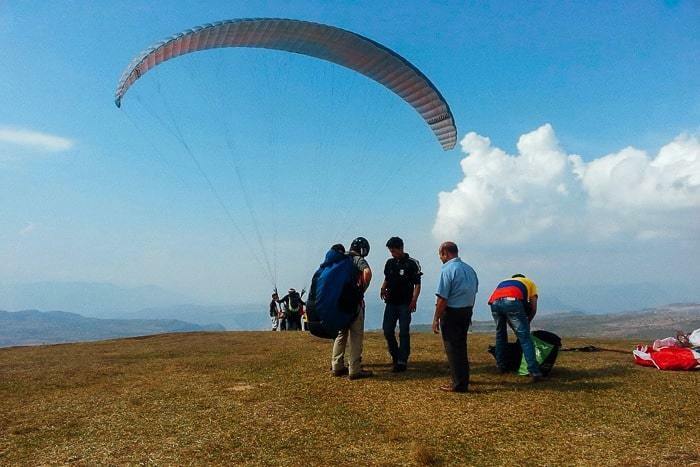 While Zipaquirá is more famous and deeper than Nemocón, they both offer an appeal for tourists. The salt mine of Zipaquirá is where you can find the very famous salt cathedral. 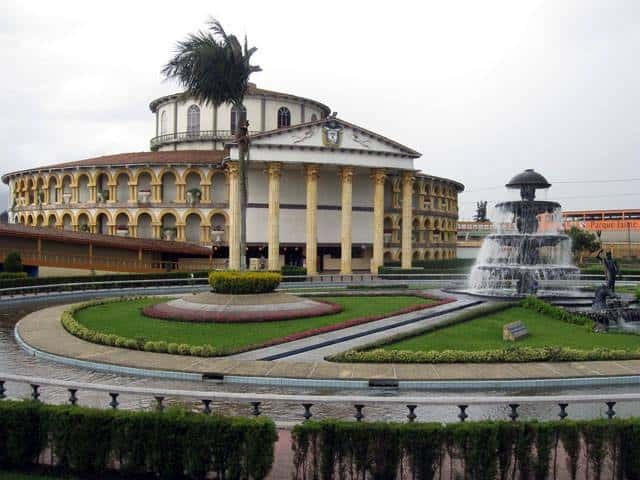 It is located in the municipality of Zipaquirá, two hours from Bogota if you go by the tourist train in the town of Usaquén or one hour by bus. It is supposedly the largest salt reserve in the world, the Salt Cathedral sits 590 feet (180 m) underground where you can take guided tours in different languages. If you want to know the entrance fees, check it out here. The Nemocón mine is half an hour from Zipaquirá and doesn’t receive quite so many visitors but both places offer a strange atmosphere with colorful lighting and water mirrors that make them magical. Visiting the salt mines is a must do. Book your Zipaquira Salt Cathedral Tour now. For those seeking a dose of nature, this 50,000-hectare national park is located in the Andes, 4 hours north-east of Bogotá between the department of Cundinamarca and the department of Meta. It attracts travelers for the diversity of fauna and flora, as well as its many lagoons. If you can, it is best to visit in the dry months of December to March, but to go you must make a reservation 15 days in advance since access is restricted. You can only reach the car by private transport (there is no public service). It offers shelter, camping areas, and 6 trails, but a simple day tour can be done in a car or by private tour. To know more and know the recommendations to go, you can visit this page in Spanish and this one. Book your Chingaza National Park tour now. 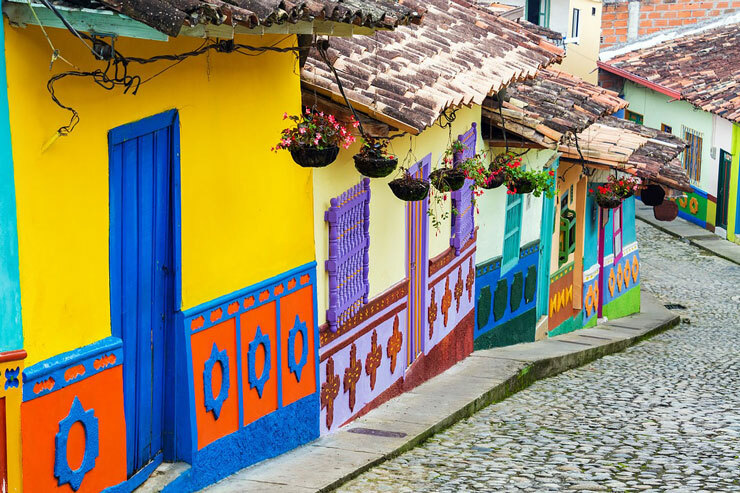 One of the best ways to hit the ground running in Bogota is to join an organized tour of the city, many of which will take you to the highlights we’ve discussed in this article. The top things I recommend are the free walking tour in Bogota along with the graffiti tour (Bogota is one of the top destinations worldwide for street art). Or for more ideas, check out my guide to the best Bogota tours that are worth your time and money. To book your tours and activities in Bogota, I recommend using Get Your Guide, they’ve got a variety of awesome stuff and at great prices. This is a fun recreational park and cultural attraction for all ages, even if it is one of those weird things to do in Bogota. 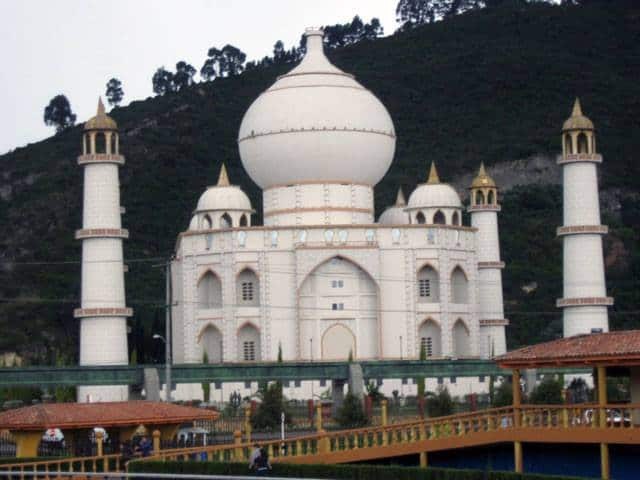 The highlight of this park is the giant replicas of the Taj Mahal and the seven wonders of the ancient world like the Pyramids of Egypt, the statue of Zeus, the Lighthouse of Alexandria, the Tomb of the Mausoleum, the Temple of Artemis, the Hanging Gardens of Babylon, and at the entrance is the statue of the Colossus of Rhodes, among many other attractions. It is located in Tocancipá on the outskirts of Bogotá, around 45 minutes along the Autopista Norte. It was founded by Jaime Duque, one of the pioneer pilots of aviation in Colombia. The best thing is that they use the profits of the park to help many different charities for children and the elderly in the country. It is a strange, interesting, and entertaining experience for both children and adults and among the most popular Bogota attractions for local Colombians. To see the schedule and entrance fee, click here. Recommending a police museum might seem bizarre, but it was a random place I stumbled across while here and also one of those cool but weird things to do in Bogota. You get a personal, guided tour by an active police officer who will explain various historical pieces in the museum (in either English or Spanish). I found this place interesting, at least. 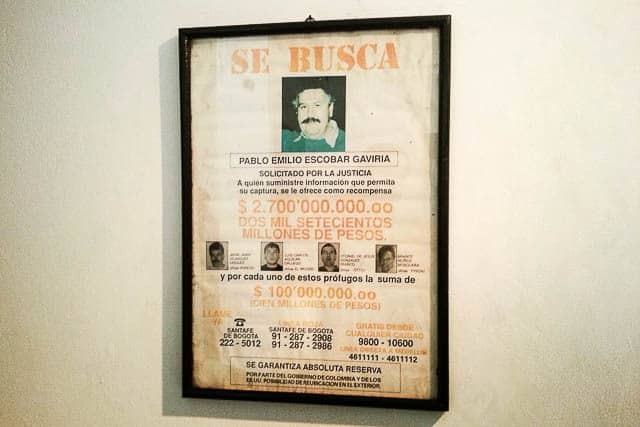 Besides, it is a source of pride for the police to explain what their institution represents and the role they have played in stopping some of the unfortunate events that have impacted the country throughout history, for example, Pablo Escobar. It is located in the La Candelaria neighborhood and is a one-hour guided tour, either in Spanish, English, French, or Portuguese, free from Tuesday to Sunday from 9 am to 5 pm. Not only are there tons of local establishments that play rock (both in English and Spanish), rather than salsa or reggaeton like in other parts of Colombia (Medellin is the capital of reggaeton and crossover), but Bogotá is also the epicenter of local and international rock concerts, so if your visit coincides with a big concert, you should take advantage of it! These massive shows with 100,000 screaming fans dying for their one chance to see these big name music gods or heroes, make a normal U.S. stadium show seem like a bobada (as they’d say here in Colombia). 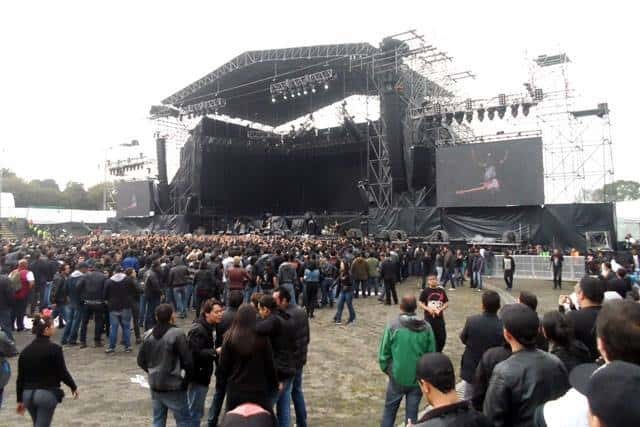 Also for more than 20 years, around the month of July, an international rock festival is held, called Rock al Parque, it is the largest free outdoor festival in Latin America and the third largest in the world. There are three days of concerts with programming that differs each year, the groups are of great quality and genres such as rock, punk, metal, reggae, and ska, however, be aware that since it is an event organized by the city, alcoholic beverages are not allowed. In this link, you will find the dates and the programming. Here’s a handy little map to help you visualize the general areas of interest in Bogota, where to go, and what things can be combined together easily. What most differentiates Bogotá from the rest of the country is the sheer amount of free or affordable cultural spaces, museums, theaters, libraries and events, as well as the restaurants of national and international cuisine, bars (I love the large number of rock bars that there are), cafes, and even shopping centers. There are a million things to do in Bogota, and this means that even if you stay for a long time, there is always something to explore and you won’t be bored. The variety of options is unlimited, so much so that even an article this long only skims the surface of everything to see and do. 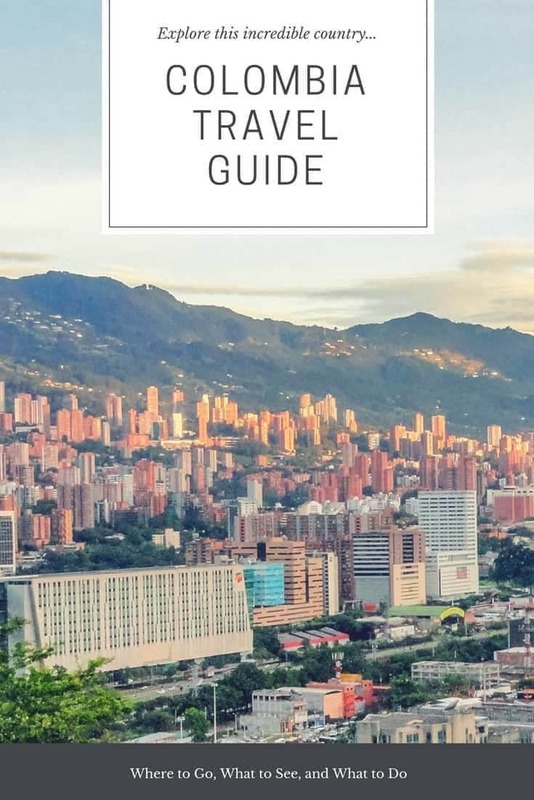 If these incredible recommendations convinced you and you decide to go to Bogotá, don’t forget your sweater and sunscreen, it is a city located at 2,640 meters (8,660 ft), which gives it a cool climate with an average temperature of 60 degrees F (15 ° C). Although it can be cold and gray when the sun comes out it can get really hot this close to the equator and you will burn quick at this altitude. In terms of safety in Bogota, it is your standard safety issues in a big city in South America or Latin America, no different than Mexico City, Lima, or Buenos Aires. I have been through a few times and I have never had a problem, but be sure to follow the basic safety tips like never flash expensive things, never travel with tons of cash, be aware of your surroundings, be careful hailing taxis on the street, and so forth. Bogota is considered one of the more dangerous cities in Colombia, unfortunately, which is only natural with so many millions of people crammed into a small area, many of whom are poor or suffering under bad socioeconomic situations and looking for an easy way out. It is important that you exercise common sense precautions in this sometimes gritty but never boring city. One important rule is to be VERY careful about using your nice cell phone while walking down the street, which are the most common targets of theft. The petty crime here in Bogota is all the more reason that you should ALWAYS have travel insurance when you are visiting overseas, but especially so in countries like Colombia. It will protect you against theft, injury, and illness, and is just a good idea. I use and recommend World Nomads Travel Insurance, and would encourage you to do the same. 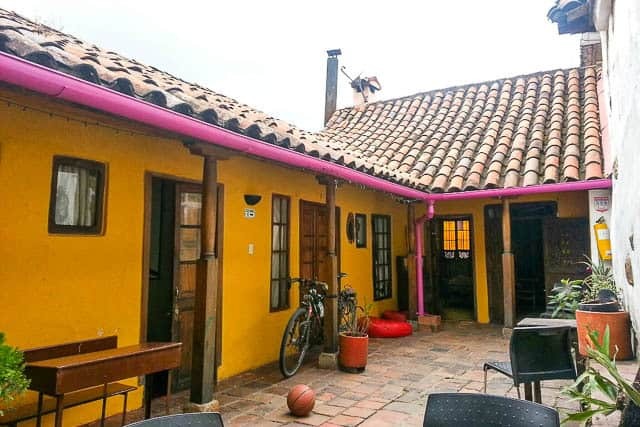 For most travelers, especially those of the budget variety, the most logical place to stay for a first-time visitor is within or close by La Candelaria. This is where the vast majority of the top attractions in Bogota are located so it will make your day-to-day logistics much easier. That being said, if you are looking for an area that is a little more upscale and cosmopolitan and not quite so “in the heart of it” then you may want to take a closer look at Chapinero, it is probably the best overall neighborhood in the city, particularly for those who will be staying a little longer or just enjoy more of the regular, everyday life rather than being on the tourist trail. Did you enjoy this post about the best things to do in Bogota? Please take a moment to share it on Facebook, Pinterest, or Twitter. I’m going on a business trip go Bogota, will be there the entire month of October. My stay there will be at the Hotel Tequendama, is this a good hotel? I haven’t stayed there personally, but it is a very well known hotel. My GF’s family stayed there during a recent trip to Bogota and they liked it. It’s a good location, for sure, just not sure about what level of amenities and whatnot you are looking for. Thanks Tim! Enjoy Bogota and whatever else you’ll be exploring here. Give me a holler if you make it to Medellin.